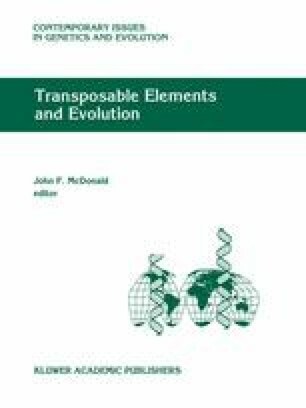 Genetic instability and rapid speciation: are they coupled? Models of rapid speciation by fixation of underdominant chromosomal rearrangements are constrained by multiple conditions on population structure and chromosomal performance. Realistic population conditions impose long periods of time to fixation or reproductive isolation, even under a model of accumulation of successive advantageous slightly underdominant rearrangements. However, when increased mutation rates are considered, fixation time is significantly reduced. Evidence is presented of high rates of chromosomal rearrangement production under genomic stress, such as in inbred and interspecific crosses. These episodes of high instability are most probably the result of mobile element transpositions, since transposition is also increased under genomic stress. Nonetheless, the evolutionary value of mobile elements to speed up speciation will be only significant if their mutagenic potential is activated in concert with population scenarios favorable to speciation events. Although this coupling needs to be demonstrated, many models of rapid speciation are carried out under population conditions favoring inbreeding and/or hybridization.